Happy New Year! I consider the entire month of January to be an opportunity for putting resolutions and goals in place, but of course you can do this at any time. Eating right and getting healthy tops the resolution list for people, so why not extend that to your dog, especially if your pudgy pooch needs to slim down? Obesity is defined as body fat that's 30 percent beyond the ideal, and this most often affects middle aged and older dogs. According to 2014 statistics published by the Association for Pet Obesity Prevention, 52.7% of dogs are overweight or obese. If you can't feel your pet's ribs, and/or she has a pendulous or bulging tummy, your dog has too much "table muscle." Obesity increases risk for diabetes, and is an aggravating factor in heart problems, arthritis, and skin problems. And when a dog carries extra weight, it's harder for the dog to exercise, which predisposes to more weight gain. If you have an overweight pet, here are 8 resolutions to help to slim down your canine companions. Eliminating or reducing treats easily cuts calories. 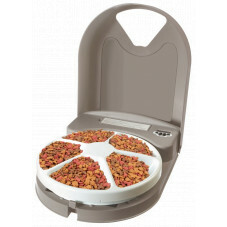 Instead, reserve part of the pet's regular diet--a handful of kibble, for instance. Keep it handy to dispense as "treats" when your dog pesters, or reward with attention, not treats. Many dogs enjoy fresh carrots and fruit. Try offering these healthy options instead of fatty table scraps. Most canines appreciate the attention as much (or more!) than what comes from your plate. Resolve to Vet the Diet. Not all reducing diets are the same, and the ones from your veterinarian work the best because they're matched to your individual dog's needs. Newer therapeutic diets available by prescription may actually alter "gene expression" to help your fat-storing dog to switch to fat-burning metabolism. Be sure to check with your vet before deciding to make major nutrition changes. Most over-the-counter reducing diets replace fat in the food with indigestible fiber, dilute calories with water, or "puff up" the product with air. "Senior" diets typically have fewer calories, so switching older pets to an age-appropriate formula helps. "Lite" diets aren't magical and only mean the food has less calories than the same brand's "regular" food--it might have more calories than another company's food. 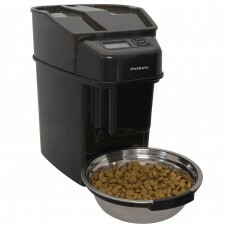 Some pets eat more of the diet food to make up for lost calories, so you still have to measure the meals. Resolve to Move His Tail. Make twice-daily 20 minute exercise part of your routine. Old dogs won't power walk, but a slow to moderate stroll at the end of the leash once or twice a day around the house or garden will help burn energy. Magic and I have our 20+ minute ramble each morning, and then two or three more 10-minute fetch-sessions throughout the rest of the day. Putting food at the top or bottom of the staircase, or across the house from the dog's bed forces your dog to move. 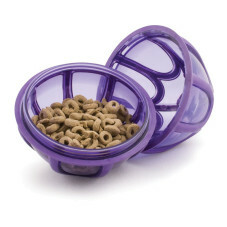 Use treat balls, puzzle toys and interactive feeders and place meals inside so the pet has to work to get out the food. 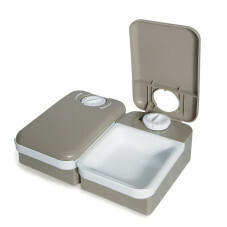 For pets that eat canned foods, there are also refrigerated feeders or insulated bowls that help keep it fresh. Resolve to Train the Brain. Staying healthy goes beyond exercising the body. The "use it or lose it" applies to your dog's mind, too, and keeping dogs engaged with problem solving and learning lubricates the brain. Think of this as rust prevention for you both. Find new ways to spice up your dog's day to day life, and you'll benefit, too. Change the route you always walk, so he gets to smell new scents, for example. Teach a new command, or adapt favorite games so your older dog can still enjoy vaulting--just lower the height. Plan play-dates with other friendly dogs so that your pet benefits from the interaction, the exercise, and the fun. I'm very fortunate that my German Shepherd, Magic, has always been super athletic, but at age 9, he's starting to slow down. In fact, he's in my own resolutions by helping me stay more active. Together, we can help keep each other healthier by paying attention to nutrition and activity levels, so we can look forward to many more New Year's resolutions.